Varieties of seaweed and alkalizing fruits and vegetables provide nutrient-dense and low-calorie additions to your healthy diet. These foods, which form the basis of many vegetarian styles of eating, can help delay the effects of aging and prevent some degenerative diseases. Among the health benefits of seaweed and alkalizing foods are their inflammation-reducing properties. Fruits and vegetables contribute the bulk of alkalizing benefits in your diet. These foods also counteract the acidifying effects of proteins and processed carbohydrates, according to Christine Lydon, author of the book, "Ten Years Thinner: Six Weeks to a Leaner, Younger-Looking You." The Western diet, high in meat protein, dairy, white flour and sugar, tips the acid-alkaline balance toward the acid end of the pH scale, which promotes inflammation. The alkalizing effects of fruits and vegetables also bring your urine into a more alkaline pH, decreasing kidney inflammation and stress and reducing your risk for developing kidney stones. 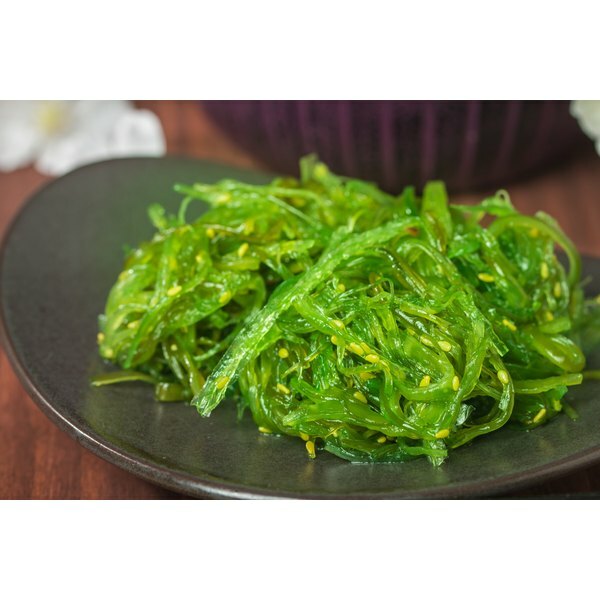 Seaweed is rich in magnesium, a mineral that helps alkalize your body. Seaweed also contains eicosapentanoic acid, an essential fatty acid known to decrease inflammation; folate; and vitamin K, according to nutritionist Barbara Rowe, author of the book, "Anti-Inflammatory Foods for Health: Hundreds of Ways to Incorporate Omega-3 Rich Foods into Your Diet to Fight Arthritis, Cancer Heart Disease and More." In a study published in the February 2011 issue of the journal, "International Immunopharmacology," doses of vitamin K inhibited inflammatory signalling molecules called cytokines, decreased levels of free radicals and decreased levels of tissue-destroying molecules. Excess acid-forming foods in the diet cause a host of health problems, including inflammation, infection and joint pain, according to Claudia Pillow, Ph.D., author of "The Gluten-Free Good Health Cookbook: The Delicious Way to Strengthen Your Immune System and Neutralize Inflammation." By contrast, alkalizing foods generally contain higher nutrient value, which contributes to pathways that quell inflammation. Additionally, an acid pH damages the lining of your intestine, allowing toxins and pathogens to enter your bloodstream and activate your immune system. Illness and allergy, both of which increase inflammation, are possible outcomes. Lemons, in particular, are highly alkalizing and can decrease your levels of inflammation-promoting histamine, according to a study published in the June 2011 issue of the journal, "Phytomedicine." In the study, a combination of lemon and quince fruit reduced histamine release and inhibited immunoglobulin E, an antibody associated with allergic reactions and asthma. Squeeze some fresh lemon into a glass of water for an alkalizing start to your day. Anti-Inflammatory Foods for Health: Hundreds of Ways to Incorporate Omega-3; Lisa M. Davis, et al. The Gluten-Free Good Health Cookbook: The Delicious Way to Strengthen Your Immune System and Neutralize Inflammation; Annalise G. Roberts, et al. Can Foods Boost the Adrenal System?